One of the objections some people have to tall cubicle panels is that they block natural light. With the trend toward “greener” and more energy efficient workspaces, this concern is understandable. You may very well want to take advantage of sunlight whenever it’s available. At the same time, glass cubicle dividers don’t really provide much protection from visual distraction. So, at OBEX we’ve come up with a solution that works for everyone. 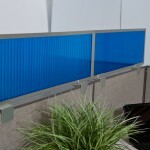 Our plastic polycarbonate cubicle wall add on is semi-transparent. It lets in the light so your employees can enjoy a brighter workplace on sunny days. The polycarbonate also diffuses the light so you don’t have to deal with glare. At the same time, these panel extenders still offer privacy to cubicle occupants. Best of all, these sturdy cubicle add-ons come in an array of attractive colors to match your branding or to add a welcome pop of color to drab, grey cubes.